For many years now I have made a pork cutlet recipe by just using flour and egg on the meat. Not wanting to use pork I decided that chicken would be an excellent option. Served with pineapple it would be so delicious. With this recipe you really don’t even need measurements. Well, I never measure like in many other recipes, I like to eyeball it. So I will try my best and give you some measurements just in case you are unsure. The thing is not to stress about amounts on this. If you run out of egg, add more, if you need more cornstarch, add more. Trick is not to be afraid to try it. Cube about 3 boneless chicken breasts and 4-5 boneless chicken thighs, while they are still partially frozen. This makes them easier to cut. Sprinkle with salt and grated garlic and refrigerate for a couple of hours. 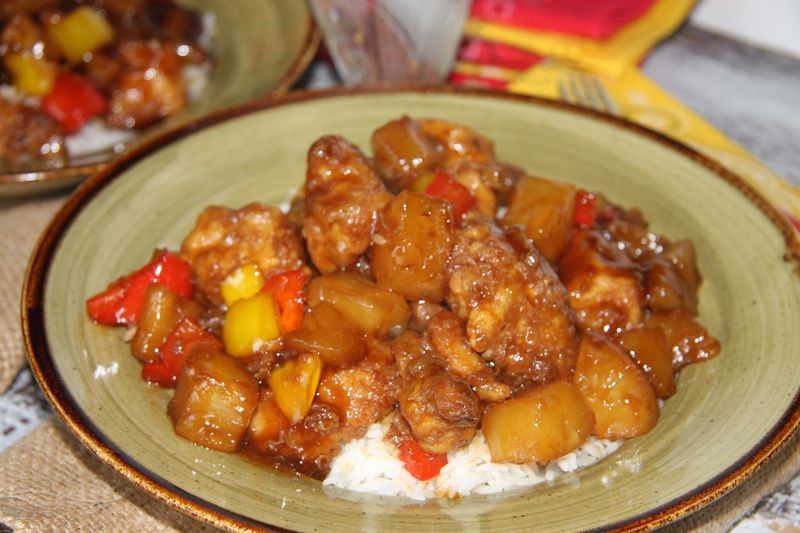 Into a bowl add 1 cup pineapple juice, 1/2 cup cranberry juice, 1 cup cornstarch, 1/2 cup soya sauce, 1/4 cup Tamari sauce and 2 cloves of minced garlic. Mix well. 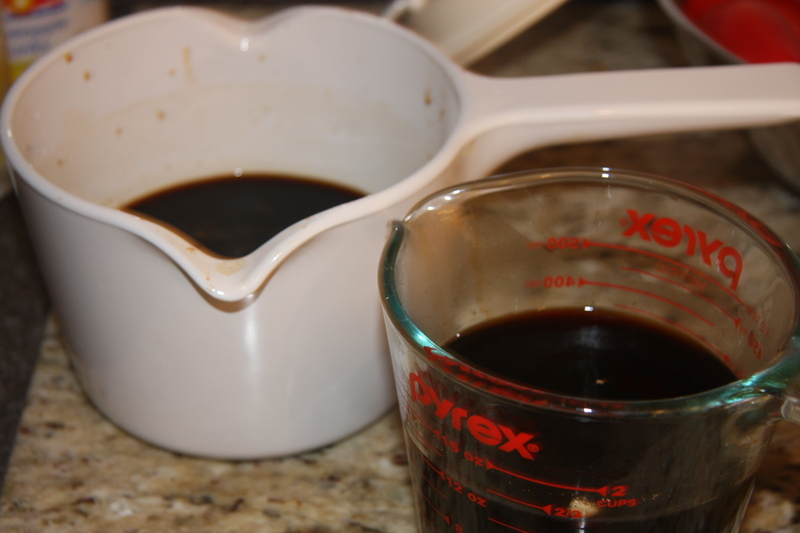 I then divided the sauce so into two containers so I can add 1 cup of brown sugar into one and into the other Lakanto a natural sweetener for the Mayor. 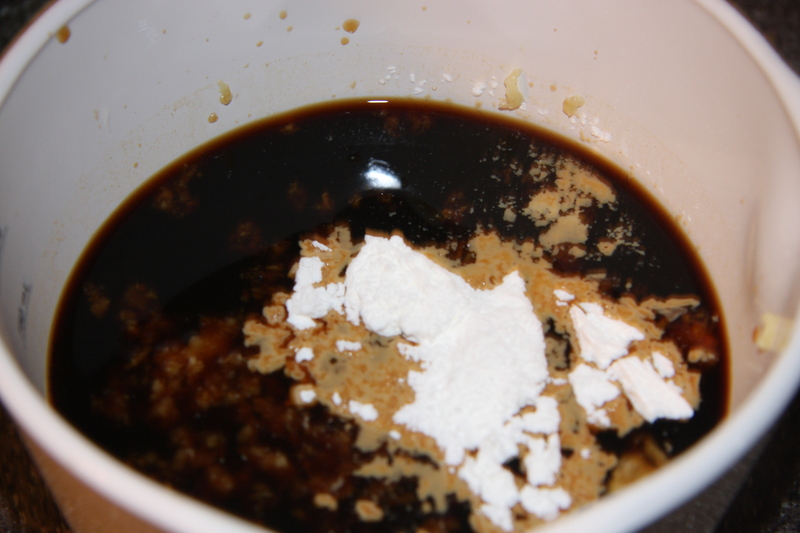 Into another bowl add 1 3/4 cups of cornstarch and place about 1 cup of the cubed chicken into it. Coat each piece well. Heated oil. Cook until golden in colour. Repeat this process until all the cubes have been done. Place the chicken into an oven proof pan right after they come out of the oil. At this point you can leave the cooked chicken, without the sauce in the fridge until your ready to use it. Great to make ahead so when you get home from work, or to serve when company comes. 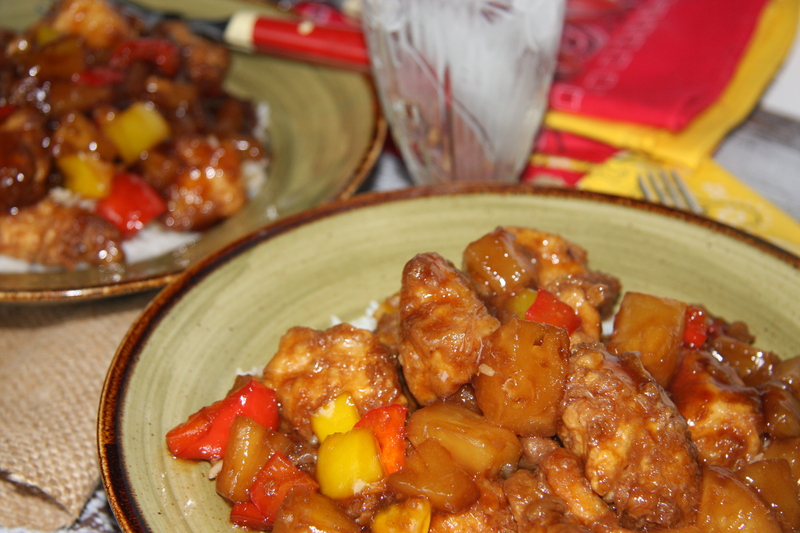 All you have to do is add the veggies, pineapple, sauce and bake. I divided mine into 2 because of the sauce. One has sugar and the other a natural sweetener. 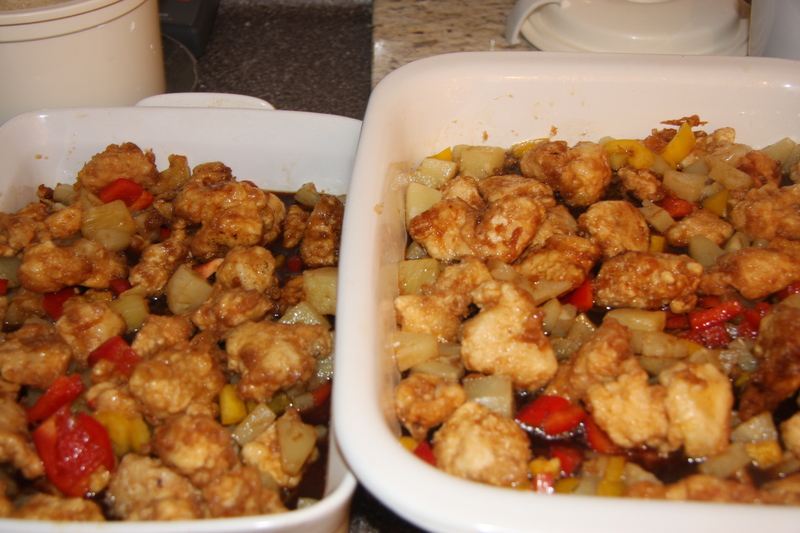 Next add 1 chopped red pepper and 1 chopped yellow pepper to the chicken, the pineapple, along with the sauce. Place into a 350 degree preheated oven. Bake for 30-40 minutes. If you find the sauce has not thickened, just add 1/4 cup cornstarch into a dish, along with 5-6 tablespoons of water, just enough to dilute the cornstarch and add it to the chicken, stir well. Leave for a couple of minutes in the oven it will thicken some more, then remove. Serve with rice. So good, even cold straight out of the fridge. The leftovers I mean. MMMMMM! 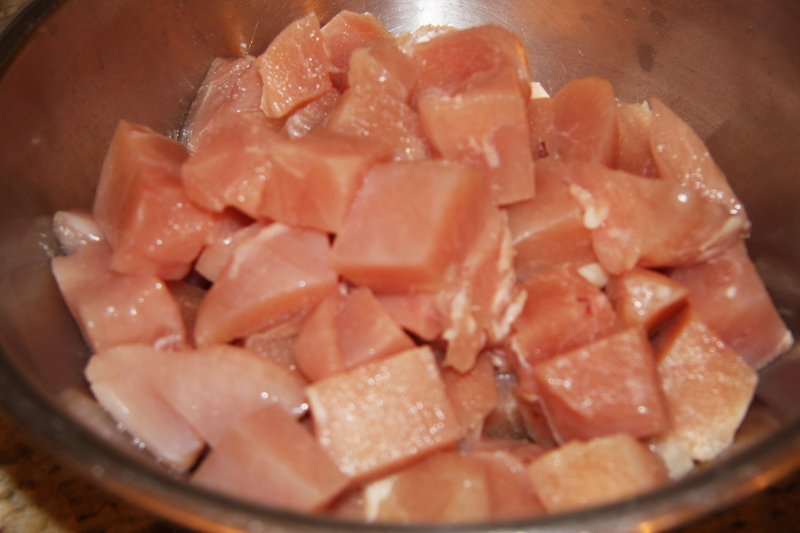 Cube chicken add 1 teaspoon salt and minced garlic. Refrigerate for a couple of hours, covered. 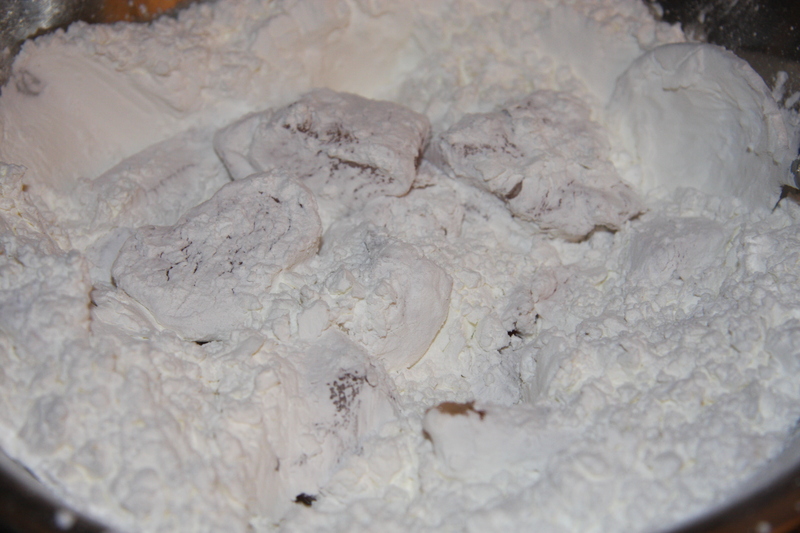 Into one bowl add the cornstarch and into another add the eggs, beat well. 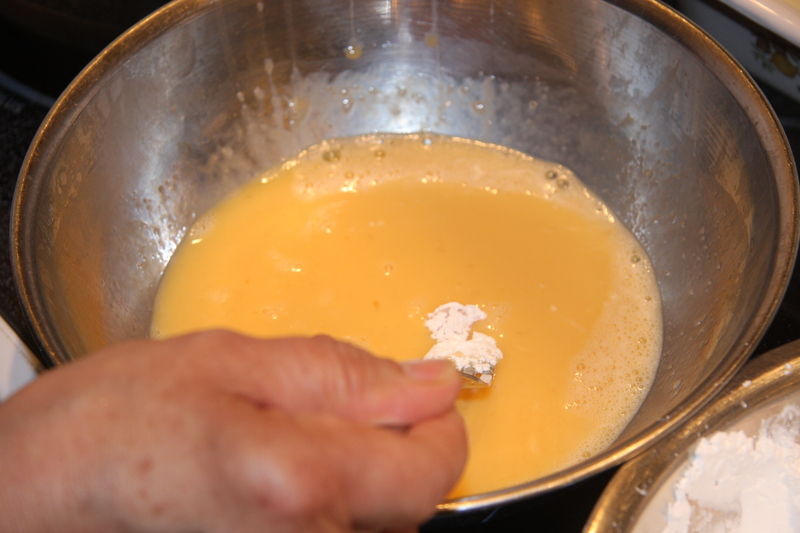 Place the chicken cubes, into the cornstarch first then into the beaten eggs. 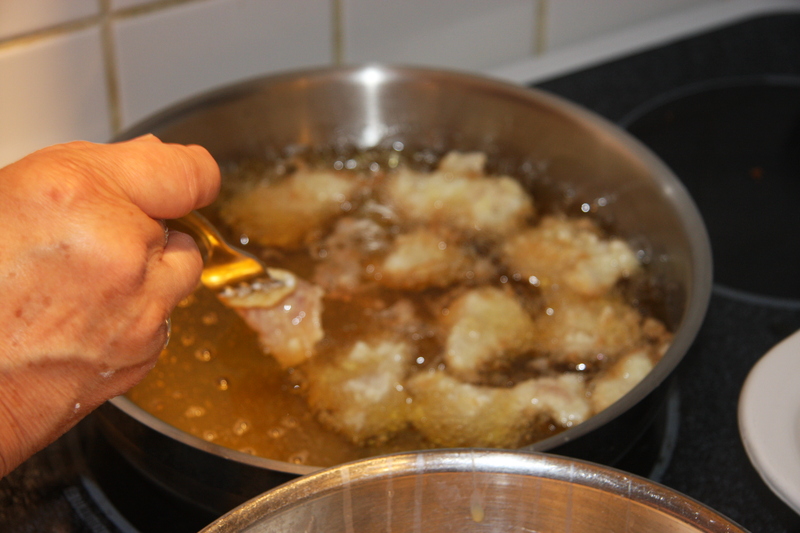 One at a time add the chicken cubes, quickly into the hot oil and fry until golden in colour. Place into an oven proof pan and add the chopped peppers, pineapple and sauce. Mix well and bake at 350 degrees for 30-40 minutes. Serve with cooked rice.